Orange San Diego smartphone is first with Intel Inside | What Hi-Fi? 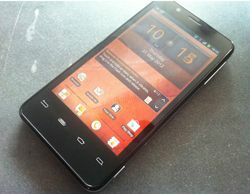 Orange has announced its San Diego smartphone, the first UK phone to be powered by Intel Inside. The Intel Atom Z2460, 1.6GHz processor powers the phone, while there's an 8MP rear camera capable of 1080p video capture and a burst mode capable of taking up to 10 frames per second with a single press of the button. There's an HDMI output, 16GB memory, WiFi, NFC and Bluetooth support and 'HD Voice' technology. Promising 'best in class performance for key consumer needs', the Orange San Diego promises up to 14 days standby battery time. The first Orange Intel smartphone will be backed by a multimillion pound advertising campaign, with more Orange-branded smartphones promised. The Orange San Diego is due on sale in the UK on June 6th. It will cost £199.99 on Orange PAYG or £15.50/month on a 24-month contract.